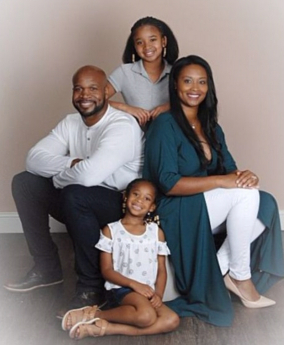 Eric Shelton with his wife Shamea and their daughters Imani (top) and Layla. 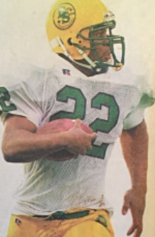 When Eric Shelton looks back on his high school days at Bryan Station, he doesn’t focus on football, or the touchdowns he scored, the headlines he earned, the victories he celebrated, the awards he received. “What I remember most was just living life without a care in the world, and appreciating my friends and my fellowship with them,” he said by phone from his home in Charlotte, N.C. When Shelton is inducted into the Dawahares/KHSAA Hall of Fame later this month, he will credit those friends for helping him earn this honor. Shelton was something to behold in high school, a 6-foot-2, 230-pound tailback/defensive tackle, a powerful locomotive with bullet-train speed. Before his senior season, the Lexington Herald-Leader did a photo shoot with a shirtless, scowling Shelton running down a railroad track. He looked more like an NFL veteran than a 17-year-old high schooler. What about the skeptics who think there was some photo-shopping involved? “Tell them it’s all natural body there, although my body doesn’t look like that anymore,” the 35-year-old Shelton said with a laugh. Shelton had to be talked into going out for football his freshman year at Bryan Station, and managed to get in a few games at defensive tackle. “I was always too big and heavy to play running back in Little League and middle school, so I just played defense,” he said. Shelton was great from the get-go. In Bryan Station’s 1998 season opener he rushed for 141 yards and 4 touchdowns in a 47-14 victory over Paul Laurence Dunbar. After the game, Nochta and assistant Jon Mirilovich (who had coached Nochta at UK) realized what they had just witnessed. “We looked at each other and I said, ‘Man, this kid is going to be a once-in-a-lifetime player,'” Nochta recalled. After rushing for more than 1,000 yards as a sophomore, Shelton powered Bryan Station’s overpowering option offense as a junior, along with quarterback J.T. Haskins, fullback Greg Shiddell. Behind a hard-working offensive line, the Defenders rushed for a state-record 5,671 yards on their way to the Class 4A state finals. Shelton led the way with 2,537 yards, averaging 10 yards a pop. He was especially hard to stop in the playoffs. In Bryan Station’s last three games he rushed for 229 yards and 2 TDs against Trinity, 232 yards and 3 TDs against Tates Creek, and 213 yards and 2 TDs against St. Xavier. The Defenders lost to St. X in the finals, falling 34-31 in overtime at Fairgrounds Stadium. “Getting to the state championship game was definitely the highlight in high school,” he said. “Not many players get to experience that. Shelton was nagged by an ankle injury his senior season but still rushed for 1,379 yards, and finished his career with 4,970 and 59 TDs. A Parade Magazine and USA Today All-American, he signed with Florida State but transferred to Louisville after his freshman year. In 22 games with the Cardinals, he had 1,728 yards and 30 TDs. Shelton was taken by the Carolina Panthers in the second round of the 2005 NFL Draft. His professional career never gained much traction due in part to injuries (foot and neck). He also felt he didn’t get a chance to prove himself. He was out of the NFL within three years, and had a difficult time adjusting to life away from the game. “It was tough for a long time because that’s what I did my whole life,” he said. “I probably harbored a lot of anger because of the way things played out. You always envision yourself doing better than you actually can; as a competitor you want to be the best. “But I left knowing I did my best. It took a long time to come to grips with it. But the older you get, you get a little wiser. He and his wife Shamea (they were high school sweethearts) are now teaching those lessons to their two daughters. Imani, who’s 11, plays AAU basketball and also likes drama. Layla, who’s 5, is into soccer and gymnastics. Nochta, who keeps in regular touch with Shelton, is proud that his former player has grown up with the right perspective and the right values, and is passing them along to his children.